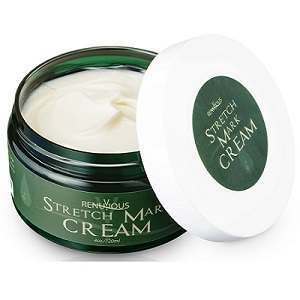 This is a product review for Renuvious Stretch Mark Cream. This cream claims to be effective in reducing stretch marks in women, particularly pregnant women. In contains ingredients that moisturize the skin, regenerate cells, promote elasticity, and reduce fine lines, as well as scars. You can learn more about this product as you read further. Olive oil- has antioxidant properties. Aloe– moisturizes the skin and plays a significant role in skin cell regeneration. Cocoa Butter- replenishes lost collagen. Shea Butter- ensures supple and elastic skin. Rose hip oil- contains essential antioxidants, fatty acids, and vitamins that fight dark spots, reduce scars, and hydrate the skin. Vitamin B5 (Panthenol)- helps the skin to attract moisture and plays a key role in stimulating skin cell renewal. Apply to hips, thighs, arms, glutes, and abdomen and massage in a radial motion until the cream is totally absorbed. For pregnant women who use the cream once daily to prevent striae, one bottle can last for several months. It can take several weeks before you see a change in your skin texture. The manufacturer claims that the ingredients in this cream are safe for pregnant women and unborn babies. This product has been cautiously formulated to assist pregnant women. The price of one bottle (120 ml) on the product’s official site is $18.99. We consider this as a fair price for a bottle of this size. Furthermore, this is an affordable price compared to the price of other products with similar ingredients and functions. We did not find any information about price discounts for this product. The manufacturer is confident that this product will achieve the promised results. In order to prove this confidence, the manufacturer has offered a risk-free trial. In addition, this product comes with a 100 percent satisfaction guarantee. Users who are not completely contented with the results can return the product and have the total purchase amount refunded without any questions asked. We found many positive reviews showing that many users are happy with the results. Based on the information acquired during this review, we believe that this is an idea product for preventing and reducing stretch marks. This product contains a strong combination of natural and trusted ingredients. The positive characteristics of this cream include a risk-free satisfaction guarantee and numerous positive testimonials. However, we did not find any information about price discounts for bulk purchases. Furthermore, it can take several weeks before you experience the expected results. David Carney	reviewed Renuvious Stretch Mark Cream	on August 15th	 and gave it a rating of 3.